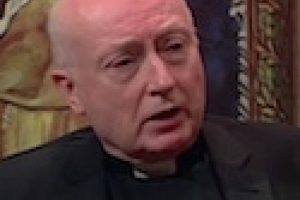 As a young seminarian in the Diocese of Brooklyn, Abbot Eugene Hayes of St. Michael’s Abbey, Silverado, CA, witnessed firsthand the vocation crisis the Church experienced shortly after the changes brought about in the wake of the Second Vatican Council. But as leader of the hundred-strong community of Norbertine fathers, brothers and novitiates living at the abbey located in rural Orange County, CA, Abbot Hayes has another sort of crisis on his hands—too many vocations and not enough space. It’s a good problem to have, but one that for the Norbertines needed immediate remedy. As a result, these Norbertines have struck gold in the Golden State and are now undertaking a multi-million dollar project to relocate the abbey in enlarged facilities. In his time as leader of St. Michael’s community, and especially during the relocation and building project, Abbot Hayes has supplemented common sense with some knowledge about how to balance dollars and sense. A native of Brooklyn, Abbot Hayes entered St. Michael’s Abbey in 1973 and studied in Rome for a theology degree which he received in 1978. He was ordained a priest in June 1977 and the following year he returned to St. Michael’s to serve as principal of the abbey’s boarding high school for two years before teaching at Mater Dei High School in Santa Ana, CA, for five years. 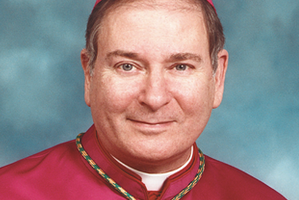 In 1985, he studied canon law at Catholic University of America where he received a doctorate in canon law in 1990. 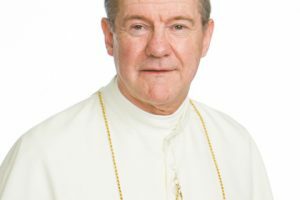 In 1988 he was elected procurator general of the Norbertines, representing the Holy See as liaison between the Vatican and the Norbertine order around the world. In 1995, he was elected abbot for life at St. Michael’s with mandatory retirement age set at 75. The Catholic Business Journal spoke with Abbot Hayes about the spiritual and material realities which help shape St. Michael’s, the challenges and rewards of the new abbey building project, and the wisdom which he’s brought to and gained from his experience as Abbot of St. Michael’s. Catholic Business Journal: What has been your own faith journey as a Catholic? Abbot Eugene Hayes: I’m the second of six children, three girls and three boys, and I grew up in Brooklyn, NY. I went to Catholic elementary school. We lived one block from the church and school. 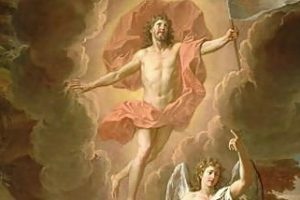 For early morning Mass, my brothers and I were frequently called on to serve. In eighth grade, I discerned – if you can use that expression for an eighth grader – that God was calling me to be a priest. CBJ: How did you discern your vocation? 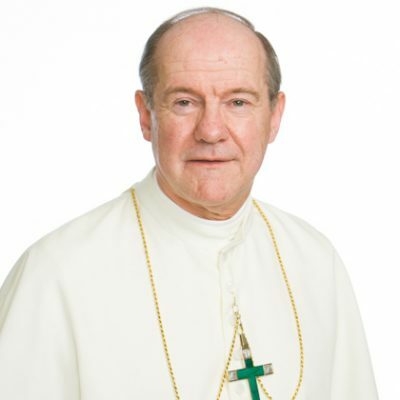 I was an altar boy, and the pastor of the parish was one of the auxiliary bishops of the Diocese of Brooklyn, NY, Bishop Charles R. Mulrooney (1959-1981). He developed a close relationship with my parents and my family. As early as my first grade, there were eighty-six students in one room with one religious sister, who was eighteen or nineteen years old. The bishop came in and said, “Oh, Sister, I bet we have some future priests in here.” So the sister said, “Alright, anyone who thinks they want to be a priest when they grow up, stand up.” Most of the boys stood up and the bishop said, “Well, we should get a couple priests out of this class!” I was attracted by the liturgy, the sacraments and of course a great love for Jesus. The privilege of serving at Mass was also exciting, being that close to the altar. But when I started talking about high school seminary, my parents were not pleased. They thought I was a genius (I wasn’t) but I guess you could say I was smart. In eighth grade, we had to take a test for entrance into the high schools of the diocese. I applied to four and I got into all four of them. There wasn’t any fight or harsh words, but it was clear my parents thought I should do something besides enter the priesthood. Bishop Mulrooney spoke to my parents, though, and only many years later did I discover what he said to them. Basically he said, “Listen, it’s a high school seminary; he’s going to be home and go to school like anyone else. If he drops out he’ll still be able to get into one of these other Catholic high schools.” They saw sense in what he said, and off I went to seminary. CBJ: Where did you go to seminary? AH:I went to the Cathedral Preparatory Seminary for high school, graduated in 1968, and attended college seminary from 1968 to 1972. There was so much going on in the country for Catholics after the Second Vatican Council and this college seminary had it all happening there too. It was crazy. Then after graduation, I began to study for my theology degree for the Diocese of Brooklyn. The theology seminary at that time was in Huntington, NY. I entered there, but soon had the idea that God was not be calling me to the diocesan priesthood at that point. CBJ: How did you discover the Norbertines? AH: A friend of mine had come out here to St. Michael’s and it was during the interterm recess, 1972-1973, that I got on a plane and flew out here to visit. I fell in love with the place. At that point, there were the seven original canons, refugees of Communist Hungary, who had founded St. Michael’s, and there were also two native-born American priests. The place had nine priests altogether, and it was a small operation at the time. The boarding high school was on the property and the liturgy was classical, both in the new Mass and the traditional Mass, with the use of Latin and Gregorian chant in both forms. CBJ: What is the history of the Norbertines? AH:The 11th century was a disaster for the Church with bad popes and corruption at all levels of the hierarchy, but especially among the priests. Then Gregory VII began what history calls the Gregorian reform, directed first and foremost at the priests. There were massive violations of clerical celibacy, which were not only a moral fault but also a challenge to the material wellbeing of the Church. A good number of these priests were married and had children, and when they died, the family had the right to claim the property – even if it was property of the Church. Gregory becomes a great reforming force and his reforming movement is active from the end of the 11th into the 12th century. St. Norbert can only be understood within that context. He was a nobleman, a bon vivant, a man at the court of the emperor before he had a St. Paul-like “Road to Damascus” experience. Like St. Paul, he was knocked off his horse and he heard a voice that told him to seek peace and strive after the good. That’s when he takes himself to a Benedictine abbey. He’s there for a period of time and he discerns that he’s supposed to be a wandering preacher, teaching the tenets of the Gregorian reform, which all boil down to the call to sanctity. He attracted not only clergy but also lay people. At that time, there were lay people withdrawing from society and going to live in deserted places, setting up some kind of common life. Norbert traveled around Western Europe with permission by the pope to preach anywhere. 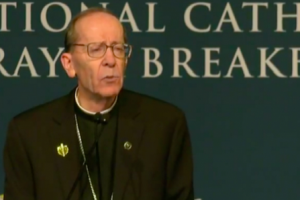 Understandably, however, bishops don’t like it when people come into their diocese to preach without their say-so. Therefore, there was a regional council of bishops who met, and they asked the Bishop of Laon, in northern France to provide Norbert with some property in a place called Premontre where he and his followers could live in common life. From this region the Norbertines took their official name: the Order of Canons Regular of Premontre. That was the beginning of the Norbertines. 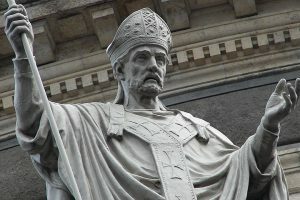 CBJ: How successful was St. Norbertine in his efforts at reform? AH:On Christmas 1121 when the first reception of the habit took place. (In 2021 we’re celebrating the 900thanniversary of the foundation of the order.) Norbert continued preaching around Europe, and he was an instrument of reconciliation for the Church. He was a Renaissance priest before there was a Renaissance – he could do all things well. Then in the 1120s, he was named Archbishop of Madgeburg in Germany, which is where he remained until 1134, the year he died. CBJ: What about this tradition attracted you to the Norbertines? AH:People told me in college that I would make a good teacher. The apostolate here was teaching. That goes back to our mother abbey in Csorna, Hungary, was founded in the late 1880s. That was the work that the Hungarian fathers decided they would devote themselves to when they were accepted into the Archdiocese of Los Angeles, which at that time included Orange County, before the Diocese of Orange was established in 1976, where they taught at Mater Dei High School. In addition, the solemn celebration of the liturgy has always been an important part of life as a Norbertine, not only in celebrating the Mass each day but also in praying the Divine Office in community. That aspect attracted me tremendously. It harkens back the monastic aspect of the Norbertines. Four days a week the Mass is in Latin and three days a week it’s in English, with the use of Gregorian chant. We have four or five CDs that have come out recording our chant performances. It’s a reflection of who we are. As the community began to grow, St. Michael’s founding abbot, Abbot Ladislas Parker, was of the mindset that we really wouldn’t be fully accepted by the greater community until we had a parish to serve. By the end of the 12thcentury, Norbertines were serving in parishes, and in parishes large enough that there were among the Norbertines some community life—several lived together at the same parish. As of now, we staff two parishes, one in the Orange Diocese and the other in the Los Angeles Archdiocese. Every Sunday, too, our priests go out to 25 different parishes to help out with Mass in several dioceses – including San Bernardino, San Diego, Orange, Los Angeles and Fresno. Every Sunday we’re in five different ecclesiastic jurisdictions. In 1997, we helped start a community of women religious who were interested in living the Norbertine life, which for women is the life of cloistered canonesses. Since it was founded in 2011, the community had grown from five founding women to right now about 40 sisters. The community was recognized by the Holy See and by the diocesan bishop and by the order as a house of canonesses of the Norbertine Order. The first seven sisters made their solemn profession as the Bethlehem Priory of St. Joseph in Tehachapi, CA. They just had their monastery built and it is now close to being filled—the same problem we have among the men. CBJ: How did you embark on the new abbey? AH:I came back to St. Michael’s from Rome and the abbey has grown from those seven Hungarian fathers to just over 50 priests and 33 young men in various stages of formation for the priesthood. We had accepted six young men for the postulancy this August, and we have two applications out, one of which we can accept but the other we will have to tell the young man to wait until next year. Frankly, we have no room – there’s no place that we can stick an extra bed, we’re that crowded. It’s a good problem to have, though, in a sense – it’s wonderful that God has blessed us with these vocations. The median age of the whole community is 42, but that includes all the young guys. But if you take the priests, our average age is 52, which is pretty good too. Shortly after I became abbot, one Saturday morning one of the canons came to me and said, “Father Abbot, you have to see this.” He took me to the end of the school building, and there had been some land slippage. It looked like someone had taken a serrated bread knife and cut into the side of the building like a loaf of bread. That was an El Nino year, so there was a lot of rain, and the ground was saturated most of the winter. We had to demolish one-third of the school building. It happened over a weekend and by Monday that part of the building was taken down. The unstable land along with growing vocations led us to think that eventually we were going to have to expand. In 2006 and 2007 we started the process. The first thing we were going to do was build here on the property. We have 34 acres that the Hungarian fathers, who had little in the way of resources when they arrived, had managed to buy a piece of property. When I became abbot, there was absolutely no debt – the Hungarians paid off everything. We didn’t have much in savings, but we were fine financially. So we started the process of building here and the geologist friends who supported us here at the abbey checked the records and did some additional testing. They said that it would be imprudent to build on this property unless you raze the buildings that exist and dig down 100 feet and re-contact the earth. So we started looking for a piece of property about eight miles from where are, 327 acres that we were able to purchase in 2011. Then we began to raise funds to approach benefactors and in March 18, two months ago, we had the groundbreaking for the new place and hope to have vertical construction begin in the beginning of July. The contract I signed said that the place will be completed March 3, 2020 “barring unforeseen circumstances.” The abbey will be built for 98 members with a brand new church with a capacity for about 550 to 600, a large conference room, guest quarters, and administration building, a cemetery and a cemetery chapel. Then phase two will see a new high school for about 100 students. In the meantime, the school will stay here at the present site. CBJ: How did you raise the funds for the property? AH: When the Hungarians came here there was nothing. There was a biker bar at the closest street corner. There were ranches and large homes in the area too. Eight miles away was the Holtz Ranch, and they were good Catholics. The parish that Father Parker helped out at is St. Cecilia’s, in the city of Tustin, CA, which was 25 minutes by car on a good day from here. We were considered to be part of that parish, geographically, and so was the Holtz Ranch. Because the parish was so big, the parish had set up two places besides St. Cecilia’s Church, where Mass was offered every Sunday, one of which was the Holtz Ranch. Regularly, Father Parker would say Mass at the Holtz Ranch house. When I became a priest, in the summer of 1978, I said Mass a few times there too. The Holtzes’ second generation, with four or five children, was not interested in maintaining the ranch. So they put the land up for sale. The first buyers were going to build trailers there; the neighbors objected and were able to stop it in the courts. Then a land developer was going to build seven equestrian estates and a school for equestrian arts. The neighborhood didn’t want anything there, though; they went to court again and this time the land developer prevailed, but he had been alienated from the community by the experience. So in the summer 2007, he was interested in selling. CBJ: How did you have the wherewithal to make the program a success? AH: Two men in particular helped tremendously in this project, Gabriel Ferrucci, and Paul Musco. We would be lost without them. Gabriel basically was in charge of the construction committee. He’s retired, eighty years old. Paul and his wife Maribelle, were the chairs of the fundraising committee, and they were major benefactors. We went to the headquarters in Las Vegas, and we found the developers were Catholics. Mr. Ferrucci, had the expertise to make a deal with these developers and in the end they sold it to us for $10 million. At that point, we had $7 million in the bank, and we got a loan for $3 million from Philadelphia Trust. We had the money two days later wired into our account, and we were able to purchase the land. Then we had to go through the process with Orange County. We had a good friend on the board of supervisors, and we submitted to the county our projection: we’ll use about 60 acres of this 327-acre property. We’ll maintain the rural, uncluttered feeling to the place. In fact, the new abbey is not going to mar the beauty, but it will enhance it. CBJ: How does the Abbot’s Circle fit in with the project? AH: It’s part of the process of raising funds. We were faced with the reality that our expenses were going to go up quite a bit and for some years we’re going to be supporting two sites, two campuses. It’s great to raise money for the project but what about the ongoing annual expenditures for the material foundation of our life? About two years ago we hired Shane Giblin, a member of Legatus in Ohio, a young man, 32, married with two children, and he moved with his family to come here and be our institutional advancement person. 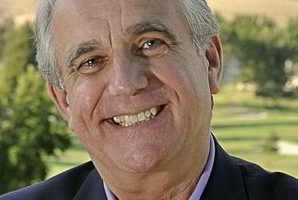 He worked for Dynamic Catholic with Matthew Kelly, and that’s a pretty successful movement, and he came to California a couple times in his work with Dynamic Catholic. After meeting with him, in May 2016 we hired him. “How will you support what you’ve built?” That was the question he was hired to answer. He came up with the idea of the Abbot’s Circle last summer. By the end of June 2017, we wanted to have 500 people sign up to make monthly donations. The average monthly donation we expected to be about $20. Here we are today, we have close to 700 people signed up – far exceeding what we wanted – and the average monthly donation is $50.49 – more than double the expected average. Shane was amazed at the results. As an example of the generosity that we were blessed with, we had an alumnus at the boarding high school in his 60s and he was here for a couple days for a retreat. When he left, he signed up for the Abbot’s Circle, and pledged to donate four times a year a donation of $10,000, or $40,000 a year. CBJ: Given your own experience with financial matters and the business of running the abbey, how can Catholic business leaders bring the monastic spirit of the Norbertines into their own professional and personal lives? AH: By example, first of all. When you know the CEO is a good practicing Catholic who believes the truths of the faith, and runs his organization with those principles, that’s the first thing. Secondly, a little background on the monastic element in the Norbertine way of life. Once every year we have a meeting of all the solemnly professed members of the Norbertines, those who made solemn vows, including some men who are not yet priests but, God willing will be ordained priests. Some historian of religious life said that the further back you go in studying the history of religious life in the Church, the more you see a certain collegiality forming the community. That body of Norbertine fathers who meet once a year are collegial but they cannot exist without the abbot. The way we worked, these business leaders see an alternative model for running a business. Does a business run better when one man is in charge or when his leadership trickles down to all the employees? Our way of governing has the best of both worlds. In one sense, we’re all responsible for the success of the community but in another sense we know that there’s one person who without question is in charge. That’s a balance that has to be there in our lives, and we like to think it serves as an invitation and example for business leaders. Has Abbot Hayes’s story inspired you to see business through the eyes of the monastic tradition of the Church? Are there ways in which you you can hone your business acumen with a little practical advice—and a whole lot of prayer? If there are ways in which you see the balance that the Norbertines bring to their way of life—harmonizing leadership and service with bottom line and the Catholic view of existence—feel free to let us know in the Comments section(you must register firstto prevent spam), or on our FaceBookpage.